The headstones for the Polish war graves all have a pointed tip and display the national emblem of Poland a crowned eagle. In addition to the names of the deceased, their date of death, their age and their unit, the words Polish Forces are engraved on the stones. They are predominately laid out in three rows with graves on both sides of the row. 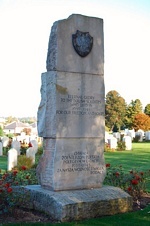 In most cases each grave contains the remains of two members of the Polish Forces. The cemetery at Perth contains about 50% of all the Polish war graves in Scotland. View the list of names of the 381 Polish Armed Forces buried at Perth. Clicking on a name will display a photograph which shows the headstone of the person concerned. A video about the Polish war gaves at Perth was made for the Polish Consulate in Edinburgh by Fresh Mint Studio and released in December 2017. Polish War Graves / Perth from freshmintstudio on Vimeo. Map of Jeanfield and Wellshill Cemetery, Perth. 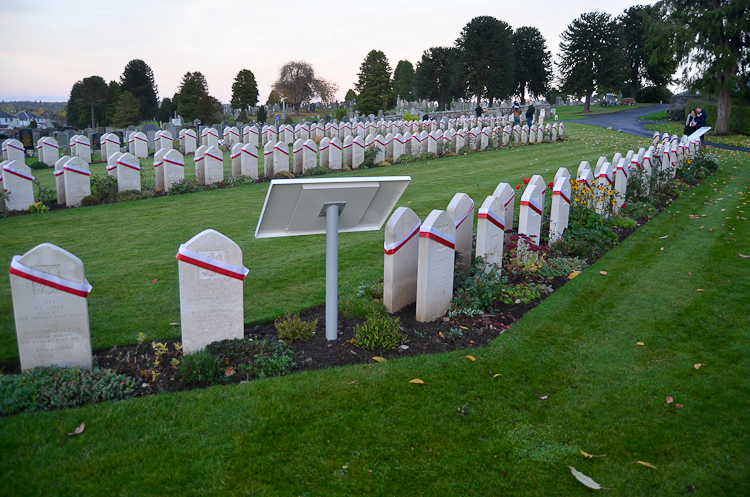 Polish War Graves Service on 6th November 2016. St John the Baptist RC Church, Perth. This page was added on 09 November 2009. Updated on 20 December 2017.